Ali was one of 25 men who epitomized modern cool. The list could have been his alone. Muhammad Ali, who died on Friday in Arizona at the age of 74, was the greatest of too many things to count, and the best of everything that makes black America supreme. His posthumous list of “mosts” is enormous. Most famous and charismatic person of the 20th century. Greatest heavyweight boxer of all time. Most polarizing and controversial athlete in modern history. Most unlikely activist (civil rights, religious freedom, human rights, universal love advocate, on and on) whose fortitude under political, professional and personal pressure completely transcends and transforms celebrity. Back in 2007, when the editorial team at Ebony magazine began work on a special concept package about the “25 coolest brothers of all time,” political candidate Barack Obama was nearing the end of his historic presidential campaign and was creating in real time his own “most” list, said Harriette Cole, Ebony’s former creative director. Dudley Brooks, Ebony’s photo editor at the time, said Obama and Ali were the two men on the cool list “that no one on staff argued against. Cool is about purpose and focus, and they had it. Ali’s purpose was to turn the basket over and look at what’s in there. He was playing a whole different game. 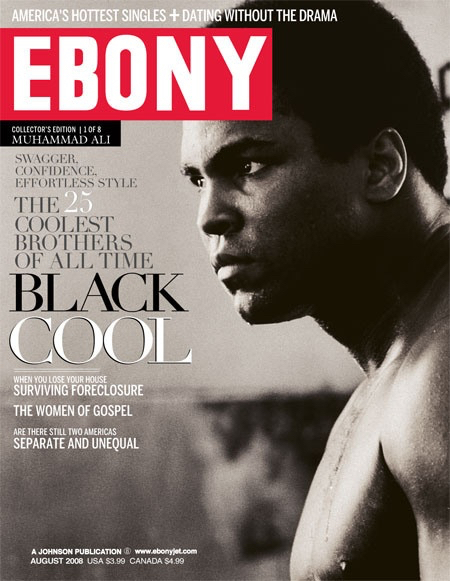 After winnowing down their initial list of more than 200 politicians, civil rights leaders, athletes, entertainers, academics and others, Ebony magazine’s editorial team narrowed the group to 25 and decided on an eight-cover run of the “Black Cool” issue. Besides Obama and Ali, the other covers featured singer Marvin Gaye, musician Prince, actors Billy Dee Williams, Denzel Washington, Samuel L. Jackson and rap mogul Jay Z. Choosing the perfect cover image of Ali meant narrowing down the thousands of photos showing The Champ in his heyday as a boxer, though there were also plenty of iconic images of him out of the ring. UNITED STATES – MARCH 02: Cassius Marcellus Clay (Muhammad Ali) with Black Muslim leader Malcolm X at 125th Street and Seventh Avenue. The now-famous series of photos from 1964 showed Cassius Clay in Harlem with Malcolm X, and highlighted the outspoken Kentucky native’s classic sense of style. “The photos from the Nation of Islam years were incredibly striking,” Brooks said. “Ali was extremely neat and precisely groomed. It may have been a Nation of Islam uniform, but it wasn’t an overstated style. American heavyweight boxing champion Muhammad Ali wearing a smart suit and a thoughtful expression, Jan. 4, 1972. Among contemporary athletes, there are those who try their hand at the style game, whether it’s Cleveland Cavalier LeBron James or retired basketball player Shaquille O’Neal or former world champion boxer Manny Pacquiao, but none of them can touch Ali, said Monroe. “Ali was the original braggart, the poet and philosopher, the comedian and the statesman,” he added. “All these current athletes will have to do a lot more work and become more multifaceted if they want to have his impact. Because it’s more than just putting a ball in a hoop.